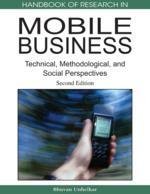 Th first part of this chapter deals with various mobile business applications and initiatives taken from real-life companies of which successfully implemented their go-to-market strategy in the wireless world. The structure of this chapter can be summarized into three main areas. At the beginning, the current market situation for mobile environment is described through highlighting how decreasing revenue is forcing companies to quickly innovate their offering to cope with highly intensive competition, justifying such an assumption with the flexible and open value chain. The second part is covering the Lateral Marketing approach in its main points under a theoretical point of view. Eventually, some examples of mobile applications and services are provided to reinforce the validity and need of Lateral Marketing to build reliable and durable growth. The diagram below describes the value chain scenario for Telecommunication operators and carriers in terms of end-to-end flow from content creation to customer with the revenue source for each step indicated with curved lines. It demonstrates that some entities might fall outside the traditional domain of telecommunication provider and, most importantly, some of those performing such activities are already in direct contact with customer: therefore there is a limited space for IT based only operators or new carriers as their development is both expensive and only a few of them can afford additional investment (and costs) after the not so rewarding bid for 3G licenses: the real challenge is to play outside the typical IT mindset and focus on new content and services to deliver. Software is already being sold as a service rather than a product via ASP (Application Service Provider) platforms, thus aggregating tools and services in some corporate areas such as Human Resources or Payroll (for example http://www.adp.com) and therefore the underneath business model is now based on different criteria. Lateral Marketing: New technique and marketing tools to find breakthrough ideas. Mobile advertising: Mobile advertising is a form of advertising via mobile (wireless) phones or other mobile devices. It is a subset of mobile marketing. Location Based Services: Location Based Services (LBS) are information and entertainment services accessible with mobile devices through the mobile network and utilizing the ability to make use of the geographical position of the mobile device. Mobile Payment: The collection of money from a consumer via a mobile device such as their mobile phone, SmartPhone, Personal Digital Assistant (PDA) or other such device. Mobile E-Health: Provision and supply of heath care via mobile device. Radio-Frequency Identification (RFID): An automatic identification method, relying on storing and remotely retrieving data using devices called RFID tags or transponders. Bar Code: A machine-readable representation of information (usually dark ink on a light background to create high and low reflectance which is converted to 1s and 0s). RFID Tag: An object that can be applied to or incorporated into a product, animal, or person for the purpose of identification using radio waves.